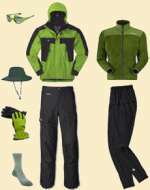 No matter the conditions, layering your hiking clothes should always be your method of dressing. You can peel off or add on layers as your activity level changes and the environment requires. Your biggest concern should always be keeping your body dry and at a safe temperature - too hot or too cold may result in disaster. In mild weather, hiking shorts and a t-shirt will work fine, but on hikes that will take more than a couple hours, layering your hiking clothes including everything from hiking pants to hiking hat is the safe and comfortable way to go. The clothes next to your body are responsible for wicking perspiration away and keeping you dry. First layer should always be a polypropylene long undershirt and underpants. Never wear cotton - it absorbs and holds moisture which chafes and makes you cold. Long underwear can be rolled up over the knees and elbows as the temperature climbs and then even removed if it really warms up. I wear the long underwear all the time when mountain hiking and have only had a few days when it got so warm I was more comfortable with it off - that was around 80 degrees. Of course, it's better to remove this layer early rather than get overheated and then chilled when the evening cool-down occurs. My wife prefers silk underwear which is just as good as polypropylene, but a bit harder to care for. Wicking liner socks fall into this category also. This layer can actually be a couple layers. It's job is to keep enough body warmth in to keep you comfortably warm while still allowing perspiration to escape. The best way to do that is to have dead air space trapped in pockets. Synthetic fabric such as fleece is usually a good, inexpensive choice. Moisture is deadly when the temperature drops or when you slow down your pace - you want moisture to get out but not in. Goose down is an excellent insulating layer - very lightweight, but expensive. For pants, a pair of nylon zip-off pants is a great layer on top of your polypropylene underpants. Clothes that are easy to slip on and off are optimal since these insulating layers will be changed as you heat up and cool down. This used to be the trouble area with layering - something that could keep out rain but still allow perspiration to escape. Gore-Tex was a break-through in outdoor wear. It's tight weave retards rain and snow, but allows perspiration vapor to pass through. Now, it's just a matter of price choice to figure out what outer shell you want to buy. Convection - wind pulling the warm air away from around your body. Conduction - an object absorbing your heat, like sitting on a cold rock or sleeping on the ground or wet clothes. Evaporation - heat loss from an object drying out, like when you get a bandanna wet and wrap it around your neck. Or, when your wet cotton t-shirt dries from the wind. An outer shell prevents all three of these heat losses and is crucial whenever you may encounter bad weather or cold temperatures. I always have a raincoat AND rainpants. Even if it is not raining, these make a very effective wind-barrier and an extra insulating layer when it gets colder. Also, these are not cheap old plastic items, these are polyester and mine happen to be from Land's End. The rainpants should have side zippers at the waist and the bottom of each leg so you can quickly slip them on and off in case of a sudden rainshower. A silnylon rain poncho that completely covers you and your pack is an ultralight protective shell option. Not as durable and multi-use as jacket and pants, it can save a lot of weight. Keeping your core body warm but not overheated is the most important thing for survival. A bare head will allow a large amount of body heat to escape - this is good on hot days, but not in dreary weather. A stocking cap should go on as soon as you start feeling a bit of chill and a wide-brimmed hat should be used for shade in the hot sun. I sleep in a stocking cap for all but about 3 months in the summer when camping because it is usually down in the 50s in the mountains and below freezing in the fall and spring. Your hands and feet don't lose as much heat, but they need to be kept warm and dry because they have poorer circulation. Wet hands get miserable quickly. Gloves with a removable synthetic liner are great. You can wear just the liner for a bit of warmth, the shell to protect from wind and rain, or both for extra warmth. Good-fitting boots or trail shoes with warm socks and liners are required for healthy, comfortable feet. Extra pairs of liners and socks so you can change into dry socks when needed is a good idea. Shorts are the pants of choice throughout the summer for most hikers. Day-hikes are typically done on beautiful days and if the weather looks dismal, hikers wait for a better day. Since that's the case, its easy to get by with just a pair of hiking shorts with big cargo pockets for your bit of gear and maybe a fanny pack for extras. I've finally worn out my last pair of shorts for hiking and now only use convertible pants. Hiking shorts are comfortable to hike in but offer no protection from weather. They are mostly just for covering up private parts and holding your keys and candybars. Convertible nylon hiking pants provide a wind-resistant layer that is usually somewhat water-resistant as well. They do not provide much insulation value since they are so light-weight but wearing them over polypropylene underwear keeps your legs warm or cool as needed in a wide temperature range. Quickly zip off the legs when it warms up or just zip open the knees when you are warming up or if you want to keep the protection from bugs, brush, and scratchy grasses to your legs. I have a few pair of these and even have one that is insect repellent. I don't know how much the repellent works, but long pants make a huge difference in comfort from mosquitos where I hike and camp. Having light-weight pants means I can stay cooler but still have bite protection. I enjoy all your detailed advice. Only an experienced and adamant hiker can give such good tips. Great job! thnx a lot for the info. a great help this is! Sep 02, 2013 - Beverly P.
great information! We're getting ready to walk the Camino De Santiago next year and this information will come in handy while we get ready to go. Thanks so much for sharing. Good tips here mate, luckily no bears in England but still a good bit of knowledge for hikers!